Plantation Shutters #22: 4 light coats of Sealcoat Shellac and all 8 frames. Looking mighty purdy. I used my Capspray 9100 4 turbine HVLP and gun for the first time spraying Sealcoat shellac onto my frames. I have learned, I have much to learn about spraying! 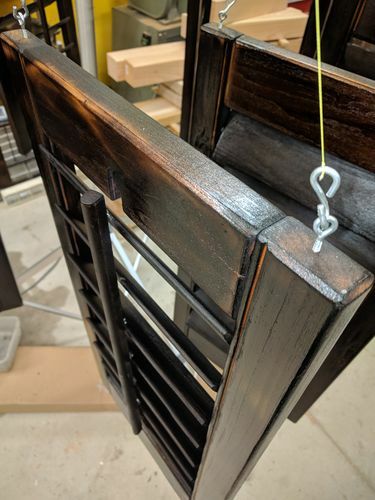 It’s easy to spray a 3” straight piece as I did for my window frame parts, but spraying a large area piece is a challenge for the first time. Experience will hopefully fix that. 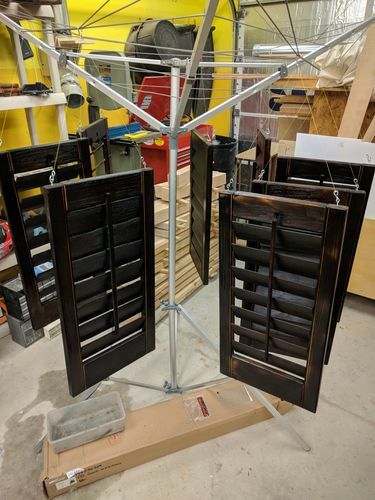 I tried to hang each frame in the backyard on a post but the actual pressure from the spray gun kept knocking it around until I braced the piece with my free hand wearing gloves. That helped but still did not feel ideal. In the end, 2 light and 2 medium coats applied with no sanding in between. As they stand, they do not look too shabby. 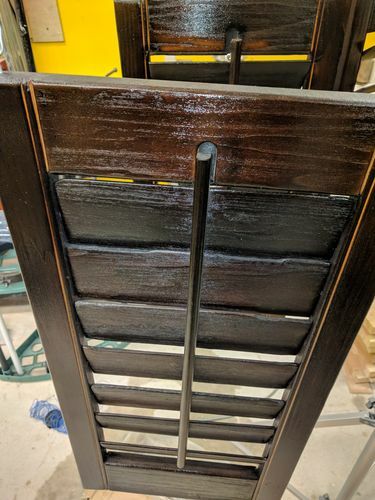 My 5th coat, I was thinking on doing the cheesecloth, DNA, shellac by hand route… akin to French Polish without the pumice or more than 1 layer. And then deciding polyurethane or not. I am thinking not, maybe. I am really liking how the charred basswood is coming along with the texture and look.